U.S. State Department OSAC: Is China Next for Social Unrest? OSAC products are for internal U.S. private sector security purposes only. Publishing or otherwise distributing OSAC-derived information in a manner inconsistent with this policy may result in the discontinuation of OSAC support. The recent social unrest and subsequent government overthrows in Egypt and Tunisia have had deep reverberations not only around the Middle East, but throughout the world. While speculation proliferates about which country will be the next to experience such tumult, a critical analysis of important variables present in both countries should be applied to any other country when making this assessment. In this report, those variables will be analyzed with respect to the People’s Republic of China, and the probability it will be the next country to experience social unrest. A major factor influencing the recent uprisings in the Middle East was unemployment. For example, Egypt’s unemployment rate for 2010 was 9.4 percent, while Tunisia’s stood at a staggering 13.3 percent. In contrast, China reports a low 4.1 percent which is slightly lower than a year prior. Moreover, the Chinese Government announced minimum wage increases in the hopes that it will close the gap between the country’s rich and poor and will assist vulnerable and potentially volatile classes of people. This includes college graduates and migrant workers that find work through internships and vocational training. China’s political leadership is acutely aware that high rates of unemployment can lead to social unrest. In this sense, the government is doing an adequate job to address unemployment’s potential impact on social stability. 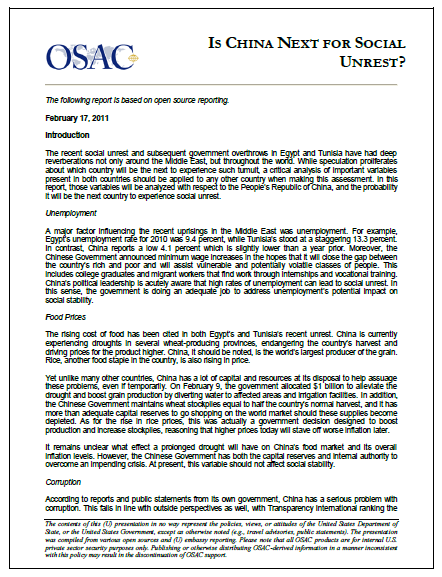 The rising cost of food has been cited in both Egypt’s and Tunisia’s recent unrest. China is currently experiencing droughts in several wheat-producing provinces, endangering the country’s harvest and driving prices for the product higher. China, it should be noted, is the world’s largest producer of the grain. Rice, another food staple in the country, is also rising in price. Yet unlike many other countries, China has a lot of capital and resources at its disposal to help assuage these problems, even if temporarily. On February 9, the government allocated $1 billion to alleviate the drought and boost grain production by diverting water to affected areas and irrigation facilities. In addition, the Chinese Government maintains wheat stockpiles equal to half the country’s normal harvest, and it has more than adequate capital reserves to go shopping on the world market should these supplies become depleted. As for the rise in rice prices, this was actually a government decision designed to boost production and increase stockpiles, reasoning that higher prices today will stave off worse inflation later. It remains unclear what effect a prolonged drought will have on China’s food market and its overall inflation levels. However, the Chinese Government has both the capital reserves and internal authority to overcome an impending crisis. At present, this variable should not affect social stability. According to reports and public statements from its own government, China has a serious problem with corruption. This falls in line with outside perspectives as well, with Transparency International ranking the﻿ country 78 out of a possible 176 in its 2010 Corruption Perception Index. The government has launched several initiatives to curb the problem, including imprisoning and sometimes executing high level officials found guilty of the crime, but it appears little headway is being made. As well as leading to crime and questionable business practices, there is said to be widespread anger over the lavish lifestyle enjoyed by some Communist party officials, police chiefs, and bosses of state-owned companies that unfairly enrich themselves in a system with little oversight. As mentioned above, the government is attempting to close the gap between the rich and the poor, but a gap does exist. When rising income inequality is taken together with the level of corruption and the higher standard-of-living it provides those benefiting from it, the situation could one day prove volatile. This variable should be considered significant when judging the potential for unrest. Possibly the greatest similarity between China, Egypt, and Tunisia is the utilization and practice of government control. China is notorious for taking a hard-line against any dissent to its one-party rule, with offenders often facing arrest and lengthy prison sentences. It also maintains an extensive apparatus to censor and control media inside the country, including blocking foreign broadcasts, mobile phone access, and social networking and other internet sites it deems inflammatory. For example, following ethnic riots in Xinjiang province in 2009, the government blocked email, text messages, and all but a small number of websites in the region for ten months in order to control and essentially black-out the opposition. During the Egyptian crisis, the word “Egypt” was actually blocked from several popular search engines, and only brief, non-substantive reports were provided in the press. This level of government control should be seen as a significant driver for potential unrest. When using these four variables, the outlook for unrest is split. However, two additional factors tip the balance in favor of the status quo holding. First, it is important to note that the government actually allows some forms of social venting. For example, it permits monitored protests over issues such as property confiscation by local governments and worker wage disputes with foreign businesses operating in China. In some instances, the government actually sides with the protesters, allowing small concessions for what it considers greater social stability. Second, the Chinese Communist Party (CCP) knows how to retain power and will use overwhelming force to keep it, as demonstrated by its handling of the ethnic uprising by Xinjiang’s Uighurs in 2009 and the Tibetans’ riots in Tibet, Sichuan, Qinghai, and Gansu provinces in 2008. Here, the government utilized its police and military strength to dominate the opposition. Unlike the aforementioned demonstrations, the government will not compromise on issues pertaining to sovereignty, autonomy, and political freedom, which it claims these groups were promoting. Looking at the combined information, at least in the near-term, the U.S. private sector should not expect to see the Middle Eastern revolutions mirrored in China any time soon.